I, along with a small circle of friends, used to have fantasies of building a car like this. It was a long time ago and it never happened. Time, money, and a shortage of clean Alfetta sedans in New England conspired to keep it a fantasy. But, boy, we used to talk about it. The Milano was based on the Alfetta, so most parts fit with little modification. 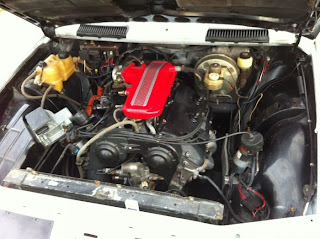 But, in order to do it right, a lot of Milano parts need to go on and in the Alfetta. It's a laborious job. It sounds like this car was done right. Besides the V6 engine and all the electronics and wiring required to make it run, this car has the transaxle, brakes, torsion bars, suspension, hubs, uprights, wheels, sway bars and more from the Milano. The seller writes, "The conversion was done in California and the car was used as a very fast V-6 daily driver in the bay area. 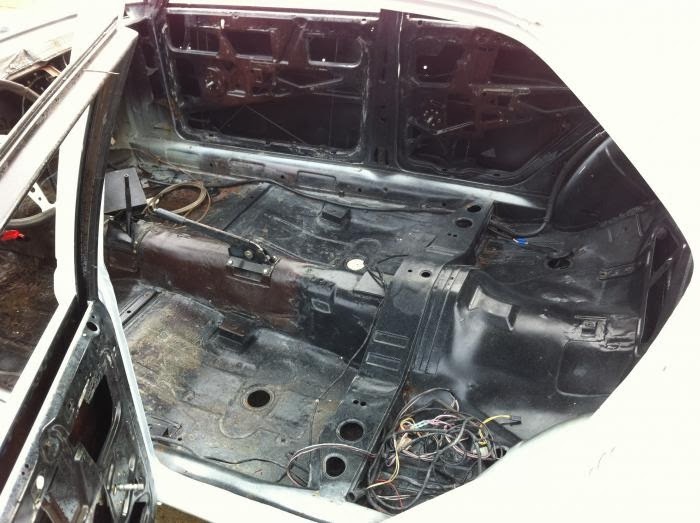 Disassembled in 1994 for a bare metal repaint and custom interior conversion. Stainless berlina bumpers were modified to fit. The straight body was sealed and primed. Hood, sunroof and trunk lid painted in black Imron. Owner moved the car to Seattle to follow a job and that's where the project stopped." Essentially, this car needs to be put back together. All the exterior pieces are included with the car. 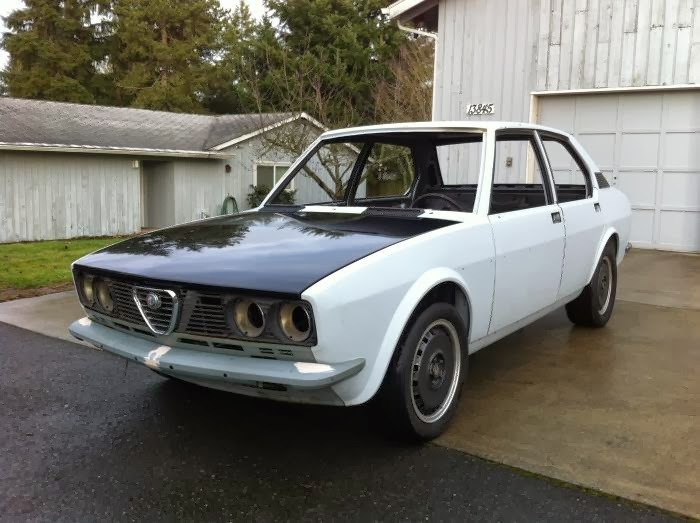 The seller is offering another Alfetta sedan (price not listed) that has the missing interior and glass. This car is being offered for a very reasonable $1500.00. 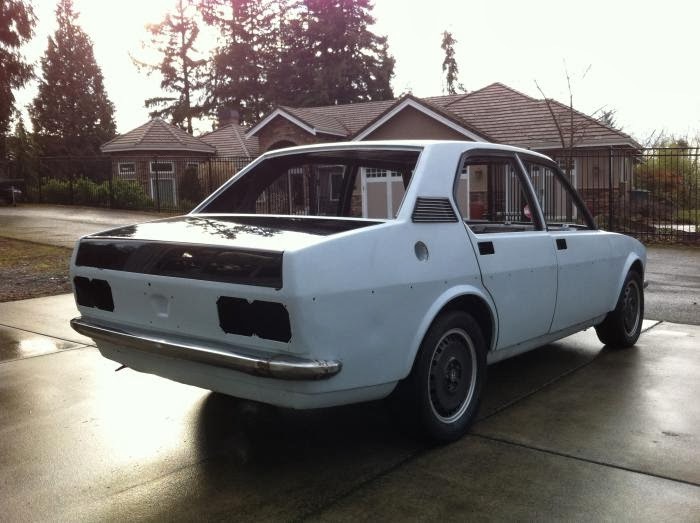 While all the really tough stuff is done, this is still a project car and it will take some time to make it roadworthy. But, when you're done, you'll have a very cool, very unique car. You'll also be the envy of a few guys in Massachusetts. Located in Bellevue, WA, click here to see the ad on the Alfa Bulletin Board. A big thanks to John for pointing out this car! I like this car, seems like it could turn out to be a great deal. Bluetoes - Ha! I thought about that as I was writing this post. But, some cars are too cool to ignore.